I started doing the music thing when I was a little kid. 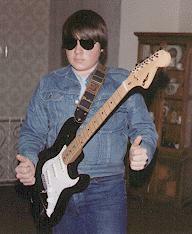 My best friend growing up was a musical genius named Steven Sidley. At around age 10 he and I got acoustic guitars for Christmas. We rocked. I took 1 year of guitar lessons when I was in the 6th grade. I learned all the classic chords and was soon playing Stairway to heaven like nobody's business. The following summer, after looking for a new instrument to conquer, a neighbor of ours told my mom that I should take up Saxophone because it was an easy instrument to play. I wanted to be a drummer, but by the end of 7th grade I was playing Alto Sax in Band and Baritone Sax in Jazz Band. The Jazz Band rocked and toured often, although we were mostly popular with the younger crowd. I was the sax man throughout Jr. High.